Club Penguin Cheats by Mimo777 Club Penguin Cheats by Mimo777: Club Penguin Coins for Change and Beyond! Awesome .. 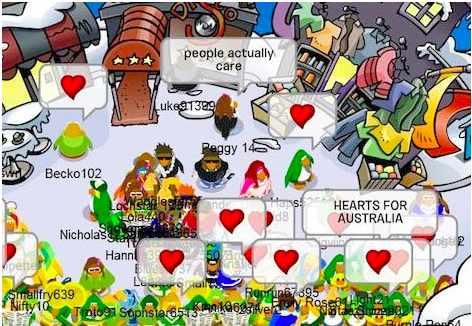 I love Club penguin ! And club penguin is the most awesome website in the whole world ! I hope that is true .. but personally I think it's a lie .. sorry . It feels great knowing that my membership money is going somewhere to help people . Special thanks to club penguin . That's Me in the photo ..
Gee, that's nice. I actually live in Australia, so it's nice to know that someone cares. BTW, Queensland is going to get hit by a Category 3 Tropical Cyclone today. Just thought I'd tell you. Club penguin is bluffing .. If you go to there citizen chip page and looked at the projects in Iraq they'll tell you that more the 9 Million Children have safe playgrounds .. And in Iraq there is no 9 Million people .. And what's up with these Lags ?! Hey, if you got a iPhone, Ipod or a iPad etc., you can go on Club Penguin's mobile website! Go to the bottom of the website and it will say... Club Penguin Disney Online Studios Canada Inc. Copyright 2010. All rights reserved. Weird, it's 2010 not Copyright 2010-2011. Wowwww Disney does something good by donating our money. Oh and I'm Australian. Luckily right now my house is in a safe area where the flood is not affecting me. And I'm overseas, so really, no point writing this. Nice! I feel so bad for Australia! That whole line is amazing! HEY HOW ABOUT THIS ALL THE AUSSIES READING THIS COMMENT MEET ME AT THE SERVER: BOBSLED TIME: 4:30 PM AEST ON THE 3RD OF FEB AND WE'LL HAVE AN AUSTRALIA PARTY!! oh no mimo! my stamps have all disappeared! All of the stamps have disappeared!!! Wow! I'm sorry for your loss... And I can sort of feel it too. Yikes, scary stuff. California doesn't have much damage except for earthquakes. I'm glad the Club Penguin caring, don't you? Oh yeah, the only section in your stamp book is the pins section. That probably explains why 0 stamps. That's where i live thank you club penguin and mimo777's followers thank you!!! I live in Australia, and it's really heartwarming to hear about all the people all across the world, from China to Canada, donating money to the flood relief and caring about the horrible stuff that has happened in the last few weeks. Keep up with the support because it helps us get through this stuff. Thank you all, and thanks to Club Penguin as well, if they are donating, it means a lot. Mimo has this happened to you? You log on and it says you don't have any stamps and you start earning the stamps you already have like the 365 day one. That happened to me and a lot of my friends! Here's one word that sums everything all up: Armageddon. It means 'End of the world'. Think about it! Cyclones in Queensland, Floods in Victoria, Bushfires in Western Australia. It's Armageddon for Australia. Mother Nature's working overtime. i am from Australia and i moved here to America for 18 months in June and ever since i heard about the floods and now the cyclone coming to Queensland i have been feeling bad but now it is good to know that people around the world care and actually want to help. Very inspirational. All my family is in QLD and they had no food because no trucks could come to their town due to the flodded roads. They had to eat tin-can food. Even McDonals had no food supply. Now the floods are over and took lives, a cyclone is about to hit and it may affect my families area. Great to see nice supporting penguins. Auzzie Auzzie Auzzie, Oi Oi Oi. Me too! I'm in Cairns, and I'm turning 12 in April. Yasi has passed, and I survived.